We report on the detection in Sloan Digital Sky Survey data of a63°-long tidal stream of stars, extending from Ursa Major to Cancer.The stream has no obvious association with the orbit of any knowncluster or galaxy. The contrast of the detected stream is greatest whenusing a star count filter that is matched to the color-magnitudedistribution of stars in M13, which suggests that the stars making upthe stream are old and metal-poor. The visible portion of the stream isvery narrow and about 8.5 kpc above the Galactic disk, suggesting thatthe progenitor is or was a globular cluster. While the surface densityof the stream varies considerably along its length, its path on the skyis very smooth and uniform, showing no evidence of perturbations bylarge mass concentrations in the nearby halo. While definitiveconstraints cannot be established without radial velocity information,the stream's projected path and estimates of its distance suggest thatwe are observing the stream near the perigalacticon of its orbit. It has been known for a long time that some red giants in globularclusters exhibit large star-to-star variations in the abundances oflight elements that are not exhibited by field giants. This fact can betaken as evidence that the extra mixing mechanism(s) that operate inglobular cluster giants may be consequences of star-star interactions inthe dense stellar environment. In order to constrain the extra mixingmechanism(s), we study the influence of helium enrichment along the redgiant branch on the evolution of stars through the horizontal branch(HB). Three possible modes of helium enrichment are considered,associated with close encounters of stars in the globular clusters. Weshow that as a consequence of the variations in the core mass, as wellas in the total mass due to mass loss, the colors of horizontal branchmodels are distributed over almost the entire range of the horizontalbranch. The results are discussed in relation to a scenario for theorigin of the abundance anomalies and for the effects on the morphologyof the horizontal branch. We argue that the star-star interactions cannot only explain the source of the angular momentum of rapid rotationbut also provide a mechanism for the bimodal distribution of rotationrates in some globular clusters. We also propose the time elapsed fromthe latest core-collapse phase during the gravothermal oscillations asthe second parameter to explain the variations in HB morphology amongthe globular clusters. The Hubble Space Telescope (HST) allows us to study the central surfacebrightness profiles of globular clusters at unprecedented detail. Wehave mined the HST archives to obtain 38 WFPC2 images of Galacticglobular clusters with adequate exposure times and filters, which we useto measure their central structure. We outline a reliable method toobtain surface brightness profiles from integrated light that we test onan extensive set of simulated images. Most clusters have central surfacebrightness about 0.5 mag brighter than previous measurements made fromground-based data, with the largest differences around 2 mag. Includingthe uncertainties in the slope estimates, the surface brightness slopedistribution is consistent with half of the sample having flat cores andthe remaining half showing a gradual decline from 0 to -0.8[dlogΣ/dlogr)]. We deproject the surface brightness profiles in anonparametric way to obtain luminosity density profiles. Thedistribution of luminosity density logarithmic slopes shows similarfeatures, with half of the sample between -0.4 and -1.8. These resultsare in contrast to our theoretical bias that the central regions ofglobular clusters are either isothermal (i.e., flat central profiles) orvery steep (i.e., luminosity density slope approximately -1.6) forcore-collapse clusters. With only 50% of our sample having centralprofiles consistent with isothermal cores, King models appear torepresent most globular clusters in their cores poorly. To explore the production of UV-bright stars in old, metal-richpopulations like those in elliptical galaxies, we have obtained HubbleSpace Telescope (HST) Space Telescope Imaging Spectrograph far- andnear-UV photometry of globular clusters (GCs) in four fields in thegiant elliptical (gE) galaxy M87. To a limit of mFUV~25 wedetect a total of 66 GCs in common with the deep HST optical-band studyof Kundu et al. Despite strong overlap in V- and I-band properties, theM87 GCs have UV-optical properties that are distinct from clusters inthe Milky Way and in M31. M87 clusters, especially metal-poor ones,produce larger hot horizontal-branch populations than do Milky Wayanalogs. In color plots including the near-UV band, the M87 clustersappear to represent an extension of the Milky Way sequence. Cluster massis probably not a factor in these distinctions. The most metal-rich M87GCs in our sample are near solar metallicity and overlap the local Egalaxy sample in estimated Mg2 line indices. Nonetheless, theclusters produce much more UV light at a given Mg2, being upto 1 mag bluer than any gE galaxy in (FUV-V) color. The M87 GCs do notappear to represent a transition between Milky Way-type clusters and Egalaxies. The differences are in the correct sense if the clusters aresignificantly older than the E galaxies.Comparisons with Galactic open clusters indicate that the hot stars lieon the extreme horizontal branch, rather than being blue stragglers, andthat the extreme horizontal branch becomes well populated for ages>~5 Gyr. Existing model grids for clusters do not match theobservations well, due to poorly understood giant branch mass loss orperhaps high helium abundances. We find that 41 of our UV detectionshave no optical-band counterparts. Most appear to be UV-brightbackground galaxies seen through M87. Eleven near-UV variable sourcesdetected at only one epoch in the central field are probably classicalnovae. Two recurrent variable sources have no obvious explanation butcould be related to activity in the relativistic jet. Aims.We present metallicity measurements of 25 stars in the bluehorizontal branch of the Galactic globular cluster NGC 2808.Methods: . Our measurements are based on moderate-resolution spectrataken with the multi-object fiber facility FLAMES-UVES, mounted onKueyen at the Very Large Telescope. Results: . We confirm thatstars hotter than a threshold temperature have super-solar abundance,while the cooler ones respect the nominal metallicity of the cluster,i.e. [Fe/H]∼eq;-1.1. The threshold temperature is estimated to beabout 12 000 K, corresponding to the so called u-jump, and coincideswith the sudden departure of the cluster horizontal branch from themodels. The metallicity increases with temperature for star hotter thanthe jump, confirming the hypothesis that the process responsible forthis abrupt metallic enhancement is the levitation due to the strongradiation field in absence of a significative convective envelope. Ametallicity dependence of the abundance enhancement is also suggested,with more metal poor clusters having a higher increase in metalcontent. Conclusions: .The slope in the temperature vs. abundancediagram is higher than the errors involved, and the metal content of thecluster plays possibly a role in determining the amplitude of the jump(more metal poor clusters show more enhancement after the jump),although other parameters, such as clusters' characteristics and eventhe atomic species involved, may also someway contribute. The structure of our stellar system. We have compiled an extensive data set on potential parts of theMonoceros tidal stream and performed an exhaustive survey of dwarfgalaxy semianalytic orbits in order to constrain its orbital properties.The best-fit orbits are subsequently realized as self-consistent N-bodysimulations in order to reproduce the spatial and velocity distributionof satellite debris. We find that all kinematic and geometricconstraints can be fit by a single stream allowing for multiple wraps.The orbital eccentricity and inclination of the progenitor are stronglyconstrained to be e=0.10+/-0.05 andi=25deg+/-5deg. Ten new estimates of propermotions from the Sloan Digital Sky Survey clearly exclude all retrogradeorbits. Particles lost by the satellite populate two nearly concentricrings, naturally explaining the detection of stream stars at both 6-8kpc (Ibata et al. ; Newberg et al.) and 12-18 kpc (the Tri/And stream;Rocha-Pinto et al.) from the Sun. We have attempted to predict thepresent location of the Monoceros stream progenitor using differentinformation: (1) the kinematical and spatial distribution of detections,and (2) the different mean metallicity in the inner and the outer rings.Because of the lack of observational data in the whole range of Galacticlatitudes, the geometrical/kinematical constraints lead to a wide rangeof possible locations. By associating older parts of the model streamwith lower metallicity parts of the observed data, we argue in favor ofa current location of l~245deg, b~-18deg, with adistance to the Sun rs~=15 kpc. The mass of the progenitorhas been poorly constrained because of the slow orbital decay. Similarfits have been obtained for masses(3-9)×108Msolar. We have analyzed thepossible common origin of the Canis Major dwarf and the Monocerosstream. The Canis Major dwarf moves on a prograde, nearly circular orbit(e~=0.16) in the Milky Way disk (i~=4+14-4 deg).This orbital inclination is too low to account for the large verticaldispersion of stream stars. However, the bimodal distribution of radialvelocities in the central region found by Martin et al. probablyindicates that their selection criteria for identifying dwarf stars leadto a contamination of background stars. In that case, the kinematicaldata outlined above might result in an underestimate of the orbitalinclination. Finally, the distance estimation to Canis Major dwarf isaround a factor of 2 smaller than that obtained from our model.Unfortunately, the possible identification of the Monoceros streamprogenitor in Canis Major remains unclear. We have compiled a sample of globular clusters with high-quality stellarabundances from the literature to compare to the chemistries of stars inthe Galaxy and in dwarf spheroidal galaxies. Of the 45 globular clustersexamined, 29 also have kinematic information. Most of the globularclusters belong to the Galactic halo; however, a significant number havedisk kinematics or belong to the bulge. Focusing on the [α/Fe] andlight r-process element ratios, we find that most globular cluster starsmimic field stars of similar metallicities, and neither clearlyresembles the currently available stellar abundances in dwarf galaxies(including globular clusters in the Large Magellanic Cloud). Theexceptions to these general elemental ratio comparisons are alreadyknown in the literature, e.g., ω Centauri, Palomar 12, and Terzan7 associated with the Sagittarius remnant and Ruprecht 106, which has ahigh radial velocity and low [α/Fe] ratio. A few other globularclusters show more marginal peculiarities. 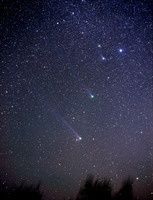 The most notable one is thehalo cluster M68, which has a high galactocentric rotational velocity, aslightly younger age, and a unique [Si/Ti] ratio. The [Si/Ti] ratiosdecrease with increasing [Fe/H] at intermediate metallicities, which isconsistent with very massive stars playing a larger role in the earlychemical evolution of the Galaxy. The chemical similarities betweenglobular clusters and field stars with [Fe/H]<=-1.0 suggests a sharedchemical history in a well-mixed early Galaxy. The differences in thepublished chemistries of stars in the dwarf spheroidal galaxies suggestthat neither the globular clusters, halo stars, nor thick disk stars hadtheir origins in small isolated systems like the present-day Milky Waydwarf satellites. The results of a wide-field survey of the Sculptor dwarf spheroidalgalaxy are presented. Our aims were to obtain an accurate map of theouter structure of Sculptor and to determine the level of interactionbetween this system and the Galaxy. Photometry was obtained in twocolors down to the magnitude limits of V=20 and I=19, covering a3.1d×3.1d area centered on Sculptor. The resulting color-magnitudedata were used as a mask to select candidate horizontal-branch (HB) andred giant branch stars for this system. Previous work has shown that thered HB stars are more concentrated than the blue HB stars. We havedetermined the radial distributions of these two populations and showthat the overall Sculptor density profile is well described by atwo-component model based on a combination of these radialdistributions. In addition, spectra of the Ca II triplet region wereobtained for over 700 candidate red giant stars over the 10deg2 region using the 2dF instrument on the Anglo-AustralianTelescope. These spectra were used to remove foreground Galactic starsbased on radial velocity and Ca II triplet strength. The final list ofSculptor members contains 148 stars, 7 of which are located beyond thenominal tidal radius. Both the photometric and spectroscopic data setsindicate no significant extratidal structure. These results support atmost a mild level of interaction between this system and the Galaxy, andwe have measured an upper mass limit for extratidal material to be2.3%+/-0.6% of the Sculptor luminous mass. This lack of tidalinteraction indicates that previous velocity dispersion measurements(and hence the amount of dark matter detected) in this system are notstrongly influenced by the Galactic tidal field. We report metallicities and radial velocities derived from spectra atthe near-infrared calcium triplet for 373 red giants in a 200arcmin2 area at the optical center of the LMC bar. These arethe first spectroscopic abundance measurements of intermediate-age andold field stars in the high surface brightness heart of the LMC. Themetallicity distribution is sharply peaked at the median value[Fe/H]=-0.40, with a small tail of stars extending down to[Fe/H]<=-2.1 10% of the red giants are observed to have[Fe/H]<=-0.7. The relative lack of metal-poor stars indicates thatthe LMC has a ``G dwarf'' problem, similar to the Milky Way. Theabundance distribution can be closely approximated by two Gaussianscontaining 89% and 11% of the stars, respectively: the first componentis centered at [Fe/H]=-0.37 with σ=0.15, and the second at[Fe/H]=-1.08 with σ=0.46. The dominant population has ametallicity distribution similar to that of the LMC's intermediate-agestar clusters. The mean heliocentric radial velocity of the sample is257 km s-1, corresponding to the same center-of-mass velocityas the disk (measured at larger radii). Because of the central locationof our field, kinematic constraints are not strong, but there is noevidence that the bar deviates from the general motion of the LMC disk.The velocity dispersion of the whole sample isσv=24.7+/-0.4 km s-1. When cut bymetallicity, the most metal-poor 5% of stars ([Fe/H]<-1.15) showσv=40.8+/-1.7 km s-1, more than twice thevalue for the most metal-rich 5%; this suggests that an old, thickerdisk or halo population is present. The age-metallicity relation (AMR)is almost flat during the period from 5 to 10 Gyr ago, with an apparentscatter of +/-0.15 dex about the mean metallicity for a given age.Comparing this to chemical evolution models from the literature, we findthat a burst of star formation 3 Gyr ago does not reproduce the observedAMR more closely than a steadily declining star formation rate. The AMRsuggests that the epoch of enhanced star formation, if any, must havecommenced earlier, ~6 Gyr ago-the exact time is model dependent. Wecompare the properties of the LMC and the Milky Way, and discuss ourresults in the context of models that attempt to use tidal interactionswith the Milky Way and Small Magellanic Cloud to explain the star andcluster formation histories of the LMC. We derive ages, metallicities, and abundance ratios ([α/Fe]) fromthe integrated spectra of 23 globular clusters in M31 by employingmultivariate fits to two different stellar population models. We alsoperform a parallel analysis on 21 Galactic globular clusters as aconsistency check and in order to facilitate a differential analysis.Our analysis shows that the M31 globular clusters separate into threedistinct components in age and metallicity; we identify an old,metal-poor group (seven clusters), an old, metal-rich group (10clusters), and an intermediate-age (3-6 Gyr), intermediate-metallicity([Z/H]~-1) group (six clusters). This third group is not identified inthe Galactic globular cluster sample. We also see evidence that the old,metal-rich Galactic globular clusters are 1-2 Gyr older than theircounterparts in M31. The majority of globular clusters in both samplesappear to be enhanced in α-elements, but the degree of enhancementis rather model-dependent. The intermediate-age globular clusters appearto be the most enhanced, with [α/Fe]~0.4. These clusters areclearly depressed in CN with respect to the models and the bulk of theM31 and Milky Way sample. Compared with the bulge of M31, M32, and NGC205, these clusters most resemble the stellar populations in NGC 205 interms of age, metallicity, and CN abundance. We infer horizontal branchmorphologies for the M31 clusters using the Rose Ca II index anddemonstrate that blue horizontal branches are not leading to erroneousage estimates in our analysis. We discuss and reject as unlikely thehypothesis that these objects are in fact foreground stars contaminatingthe optical catalogs. The intermediate-age clusters have generallyhigher velocities than the bulk of the M31 cluster population.Spatially, three of these clusters are projected onto the bulge region,and the remaining three are distributed at large radii. We discuss theseobjects within the context of the build-up of the M31 halo and suggestthat these clusters possibly originated in a gas-rich dwarf galaxy,which may or may not be presently observable in M31. Inspection of the CM diagrams of globular clusters having similar heavyelement content shows that the luminosity of the red giant bump relativeto the turnoff (Δ V_TO^bump) differs by more than 0.1 mag betweenclusters with different horizontal branch morphology. Unfortunately,careful consideration of the data leaves us with only one pair (M 3 andM 13) of clusters suitable for a quantitative discussion. For this pairwe consider differences in age and helium content as possible causes forthe difference in Δ V_TO^bump, and find more convincing supportfor the latter. A larger helium content in M 13 stars (Y  0.28 vs.Y  0.24) accounts for various CM diagram features, such as thedifference in the luminosity level of RR Lyr variables and of the redgiant bump with respect to the turnoff luminosity and the horizontalbranch morphology. This enhanced helium can be tentatively understood inthe framework of self-enrichment by massive asymptotic giant branchstars in the first ~100 Myr of the cluster life. A modestself-enrichment can be present also in M 3 and can be the reason for thestill unexplained presence of a not negligible number of luminous,Oosterhoff II type RR Lyr variables. The hypothesis that a larger heliumcontent is the second parameter for clusters with very blue horizontalbranch morphology could be checked by an accurate set of data for moreclusters giving turnoff, RR Lyrs and bump magnitudes within a uniquephotometry. We present abundance measurements, based on high-resolution opticalspectroscopic data obtained with the Ultraviolet and Visual EchelleSpectrograph mounted on Kueyen (Very Large Telescope UT2), for ten starsin the extended blue horizontal branch of the Galactic globular clusterNGC 1904 (M79). In agreement with previous findings for other clusters,we obtain normal abundances for stars cooler than T_eff 11 000 K,and largely anomalous abundances for hotter stars: large He depletions,and overabundances of Fe, Ti, Cr, P and Mn. The abundances of Mg, Si andCa are roughly normal, in the hot stars as well as in the cooler ones.This abundance pattern can be attributed to the onset of diffusion andto radiation pressure in the stable atmospheres of hot horizontal branchstars. We investigate the hypothesis that some fraction of the globularclusters presently observed in the Galactic halo formed in externaldwarf galaxies. This is done by means of a detailed comparison betweenthe `old halo', `young halo' and `bulge/disc' subsystems defined by Zinnand the globular clusters in the Large Magellanic Cloud, SmallMagellanic Cloud, and Fornax and Sagittarius dwarf spheroidal galaxies.We first use high-quality photometry from Hubble Space Telescope imagesto derive a complete set of uniform measurements of horizontal branch(HB) morphology in the external clusters. We also compile structural andmetallicity measurements for these objects and update the data base ofsuch measurements for the Galactic globular clusters, including newcalculations of HB morphology for 11 objects. Using these data togetherwith recent measurements of globular cluster kinematics and ages weexamine the characteristics of the three Galactic cluster subsystems.Each is quite distinct in terms of their spatial and age distributions,age-metallicity relationships, and typical orbital parameters, althoughwe observe some old halo clusters with ages and orbits more similar tothose of young halo objects. In addition, almost all of the Galacticglobular clusters with large core radii fall into the young halosubsystem, while the old halo and bulge/disc ensembles are characterizedby compact clusters. We demonstrate that the majority of the externalglobular clusters are essentially indistinguishable from the Galacticyoung halo objects in terms of HB morphology, but ~20-30 per cent ofexternal clusters have HB morphologies most similar to the Galactic oldhalo clusters. We further show that the external clusters have adistribution of core radii which very closely matches that for the younghalo objects. The old halo distribution of core radii can be very wellrepresented by a composite distribution formed from ~83-85 per cent ofobjects with structures typical of bulge/disc clusters, and ~15-17 percent of objects with structures typical of external clusters. Takentogether our results fully support the accretion hypothesis. We concludethat all 30 young halo clusters and 15-17 per cent of the old haloclusters (10-12 objects) are of external origin. Based on cluster numbercounts, we estimate that the Galaxy may have experienced approximatelyseven merger events with cluster-bearing dwarf-spheroidal-type galaxiesduring its lifetime, building up ~45-50 per cent of the mass of theGalactic stellar halo. Finally, we identify a number of old halo objectswhich have properties characteristic of accreted clusters. Several ofthe clusters associated with the recently proposed dwarf galaxy in CanisMajor fall into this category. Globular clusters in the outer halo (Rgc > 15kpc) arefound to be systematically fainter than those at smaller Galactocentricdistances. Within the outer halo the compact clusters with half-lightradii Rh < 10pc are only found at Rgc <40kpc, while on the other hand the larger clusters with Rh> 10pc are encountered at all Galactocentric distances. Among thecompact clusters with Rh < 10pc that have Rgc> 15kpc, there are two objects with surprisingly high metallicities.One of these is Terzan 7, which is a companion of the Sagittarius dwarf.The other is Palomar 1. The data on these two objects suggests that theymight have had similar evolutionary histories. It is also noted that,with one exception, luminous globular clusters in the outer halo are allcompact whereas faint ones may have any radius. This also holds forglobular clusters in the Large Magellanic Cloud, Small Magellanic Cloudand Fornax dwarf. 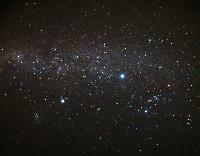 The lone exception is the large luminous globular NGC2419. Possibly this object is not a normal globular cluster, but thestripped core of a former dwarf spheroidal. In this respect it mayresemble ω Centauri. We present an analysis of the asymmetries in the population of GalacticM-giant stars present in the 2MASS All Sky catalogue. Severallarge-scale asymmetries are detected, the most significant of which is astrong elliptical-shaped stellar overdensity, close to the Galacticplane at (l= 240°, b=-8°), in the constellation of Canis Major.A small grouping of globular clusters (NGC 1851, 1904, 2298 and 2808),coincident in position and radial velocity, surround this structure, asdo a number of open clusters. The population of M-giant stars in thisoverdensity is similar in number to that in the core of the Sagittariusdwarf galaxy. We argue that this object is the likely dwarf galaxyprogenitor of the ring-like structure that has recently been found atthe edge of the Galactic disc. A numerical study of the tidal disruptionof an accreted dwarf galaxy is presented. The simulated debris fits theextant position, distance and velocity information on the Galactic`Ring', as well as that of the M-giant overdensities, suggesting thatall these structures are the consequence of a single accretion event.The disrupted dwarf galaxy stream orbits close to the Galactic plane,with a pericentre at approximately the solar circle, an orbitaleccentricity similar to that of stars in the Galactic thick disc, aswell as a vertical scaleheight similar to that of the thick disc. Thisfinding strongly suggests that the Canis Major dwarf galaxy is abuilding block of the Galactic thick disc, that the thick disc iscontinually growing, even up to the present time, and that thick discglobular clusters were accreted on to the Milky Way from dwarf galaxiesin co-planar orbits. We have obtained spectra with a resolution of ~2.5 Å in the regionof ~7500-9500Å for 116 red giants in five galactic globularclusters and six old open clusters (five with published metallicitiesand one previously unmeasured). The signal-to-noise (S/N) ratio lieswithin the range 20 <= S/N <= 85. We measure the equivalent widthsof the infrared CaII triplet absorption lines in each star and comparethem with cluster metallicities taken from the literature. With globularcluster abundances on the Carretta & Gratton scale, and open clusterabundances taken from the compilation of Friel and collaborators, wefind a linear relation between [Fe/H] and CaII line strength spanningthe range -2 <~[Fe/H]<~-0.2 and 2.5 <~ (age/Gyr) <~ 13. Thereference abundance scales appear to be consistent with each other atthe ~0.1 dex level. Alternate choices for metallicity scales canintroduce curvature into the relation between the [Fe/H] and CaIIequivalent width. No evidence for an age effect on the metallicitycalibration is observed. Using this calibration, we find the metallicityof the massive, old, open cluster Trumpler 5 to be [Fe/H]=-0.56 +/-0.11. This is the first spectroscopic abundance measurement for Trumpler5, and is lower by ~0.3 dex than estimates based on the clustercolour-magnitude diagram. Considering the 10 clusters of knownmetallicity shifted to a common distance and reddening, we find that theadditional error introduced by the variation of horizontal branch/redclump magnitude with metallicity and age is of the order of +/-0.05 dex,which can be neglected in comparison with the intrinsic scatter in themethod. The results are discussed in the context of abundancedeterminations for red giants in Local Group galaxies. Abundance variations within globular clusters (GCs), and of GC starswith respect to field stars, are important diagnostics of a variety ofphysical phenomena, related to the evolution of individual stars, masstransfer in binary systems, and chemical evolution in high densityenvironments. The broad astrophysical implications of GCs as buildingblocks of our knowledge of the Universe make a full understanding oftheir history and evolution basic in a variety of astrophysical fields.We review the current status of the research in this field, comparingthe abundances in GCs with those obtained for field stars, discussing indepth the evidence for H-burning at high temperatures in GC stars,describing the process of self-enrichment in GCs with particularreference to the case of the most massive Galactic GC ( Cen), anddiscussing various classes of cluster stars with abundance anomalies.Whereas the overall pattern might appear very complex at first sight,exciting new scenarios are opening where the interplay between GCdynamical and chemical properties are closely linked with each other. Newberg et al., Yanny et al., Ibata et al., Rocha-Pinto et al., andMartin et al. have reported overdensities of stars that form a ring witha galactocentric distance (Rgal) of <~18 kpc. Martin etal. and Frinchaboy et al. have found star clusters associated with theseoverdensities; Martin et al. found what seems to be the centraloverdensity in Canis Major, so we shall refer to it as the CMa ring. Thestars in the CMa ring have a small velocity dispersion and [Fe/H] ofabout -0.4 and -1.6, respectively. Zinn et al. found a small RR Lyraeoverdensity in the more populous southern arc of the CMa ring. We do notfind any overdensity of RR Lyrae stars in a 65 deg2 fieldthat covers a more tenuous part of the ring in the anticenter. Existingevidence suggests that the halo component of the CMa ring has ahorizontal-branch (HB) morphology that does not favor RR Lyrae stars;the evidence from the associated clusters suggests that it may be richerin blue HB stars. Our RR Lyrae sample in the anticenter contains threegroups (each containing three stars that have a high probability ofphysical association). These groups account for half of the RR Lyraestars with 17 kpc<=Rgal<=28 kpc in this field; all ofthese RR Lyrae stars are of Oosterhoff I type. 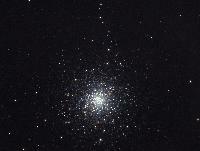 It is suggested that theymay be globular cluster remnants. We report the discovery of two binary millisecond pulsars in thecore-collapsed globular cluster M30 using the Green Bank Telescope (GBT)at 20 cm. PSR J2140-2310A (M30A) is an eclipsing 11 ms pulsar in a 4 hrcircular orbit, and PSR J2140-23B (M30B) is a 13 ms pulsar in an as yetundetermined but most likely highly eccentric (e>0.5) andrelativistic orbit. Timing observations of M30A with a 20 month baselinehave provided precise determinations of the pulsar's position (within 4"of the optical centroid of the cluster) and spin and orbital parameters,which constrain the mass of the companion star to bem2>~0.1Msolar. The position of M30A iscoincident with a possible thermal X-ray point source found in archivalChandra data, which is most likely caused by emission from hot polarcaps on the neutron star. In addition, there is a faint(V555~23.8) star visible in archival Hubble Space Telescope(HST) F555W data that may be the companion to the pulsar. Eclipses ofthe pulsed radio emission from M30A by the ionized wind from the compactcompanion star show a frequency-dependent duration(~ν-α with α~0.4-0.5) and delay the pulsearrival times near eclipse ingress and egress by up to 2-3 ms. Futureobservations of M30 may allow both the measurement of post-Keplerianorbital parameters from M30B and the detection of new pulsars throughthe effects of strong diffractive scintillation. The Galactic anticenter stellar structure (GASS) has been identifiedwith excess surface densities of field stars in several large-area skysurveys and with an unusual, stringlike grouping of five globularclusters. At least two of these are diffuse, young ``transitional''clusters between open and globular types. Here we call attention to thefact that four younger open or transitional clusters extend thepreviously identified, stringlike cluster grouping, with at least onehaving a radial velocity consistent with the previously found GASSvelocity-longitude trend. All nine clusters lie close to a plane tipped17° to the Galactic plane. This planar orientation is used to foragefor additional potential cluster members in the inner Galaxy, and anumber are found along the same plane and stringlike sequence, includingalmost all 15 known outer, old open clusters. Tidal accretion of a dwarfsatellite galaxy on a low-inclination orbit-perhaps the GASSsystem-appears to be a plausible explanation for the origin of theouter, old open and transitional clusters of the Milky Way. We use theseclusters to explore the age-metallicity relation of the putativeaccreted GASS progenitor. Finally, we provide the first radial velocityof a star in the cluster BH 176 and discuss its implications.